I started the week thinking I would not manage to tackle the last bed any further than I had already done. It was supposed to rain and - because of the Summer Bank Holiday - the week was only four days long anyway, one of which was team day. My plan was therefore to concentrate on completing the stock-checking of all the rest, leaving any extra time I could find for the last bed. Then, the first good news. I was allowed to carry on with my stock-checking on team day. 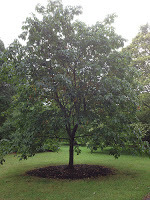 It was the perfect, not-too-wet and quiet day, and I managed to sort all of the self-standing trees in the area. And it did not rain, rather we had fantastic sunny days, so on Wednesday I asked for a skip and threw myself into the Cotoneaster. Literally. I did not manage to finish it all by Friday, but I did manage to complete what I had set out to achieve on Wednesday. 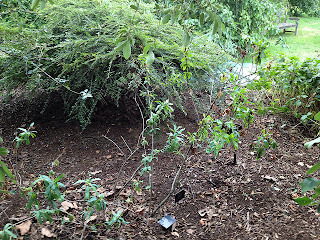 There is now breathing space for all the plants in the bed, even though some of the mat-forming Cotoneaster was too tangled for me to take on. My pacing was kept up by the lovely David, who supplied me with 3 skips a day on Wednesday and Thursday, and one more on Friday: I filled them all, and did not manage to finish until 2pm on my last day, and with hands slightly shaky. But then it was done. When I started, this is how it looked. By the end, this was it. ... just in time for me to hear the engine of David's tractor, coming to take the last of my skips. 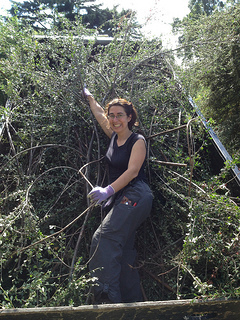 I felt such a sense of accomplishment: I think that might just come through in the picture I got posing with my last skip! Everybody was great with me on my last day (which I had started feeling sad and tired): I got offered coffee and cookies, nice compliments all round, and even a pint! Yes, because we all turned up at the pub - The Botanist that is - the regular Friday haunt, at the end of the day. 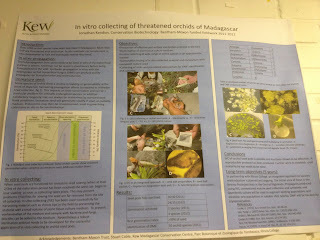 I had the honour of a private visit to the micropropagation lab, or "microprop" as it is familiarly known. As I had not managed to go on the interns' tour last month and, since the next one is after I'm gone, my tutor suggested I ask the department if they could see me on my own, and they have been fantastic! Given it was only me, they made an exception to take me into the sterile rooms, which was amazing, and also why I do not have too many pictures: I wanted to keep a low profile - me and my contaminants! 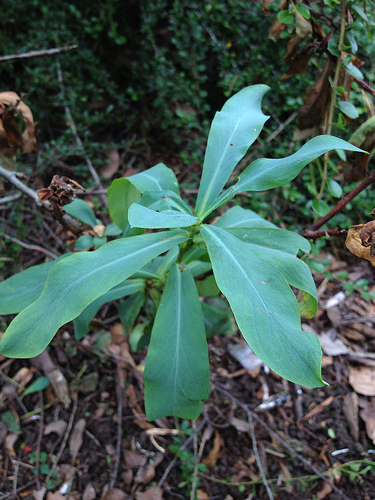 What they do in the lab is to try and propagate plants that do not grow easily from seed (called recalcitrant as they do not store well and are viable only when fresh), and endangered plants, at risk of extinction in the wild. 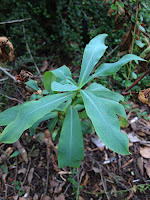 The preference is always to propagate from seed, so as to maximise genetic diversity and give plants a better chance when they are reintroduced in the wild. 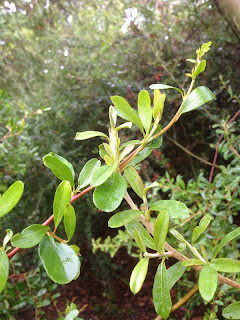 However, that is not always necessary, or wanted, for example in the case of clones propagated for some specific characteristics that are used only for amenity purposes. Sometimes, propagating from seed is outright impossible. I was told of plants rescued from the last living clump! 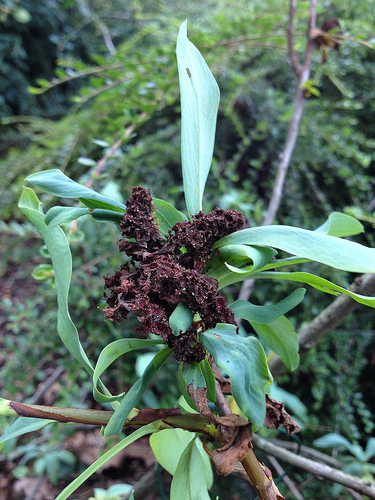 The story of Anogramma ascensionis, the Ascension island parsley fern, rescued from the last four plants located on a steep cliff, is rather fascinating. There's a whole article on this in the Kew magazine. are the main groups studied in the lab. They are propagated, each one according to a specific protocol based on their requirements, which takes into account anything from the composition of the substrate on which they are grown to the conditions of growing and weaning. 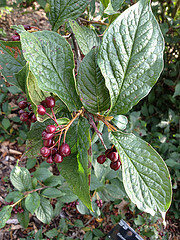 Plant material for which a suitable growing technique has already been developed is cryopreserved in liquid nitrogen, to ensure a state of suspended growth that is not prone to genetic mutations. I was shown some bryophytes that had been stored on a piece of paper coated with a protective substance, alginate, then coated over again. 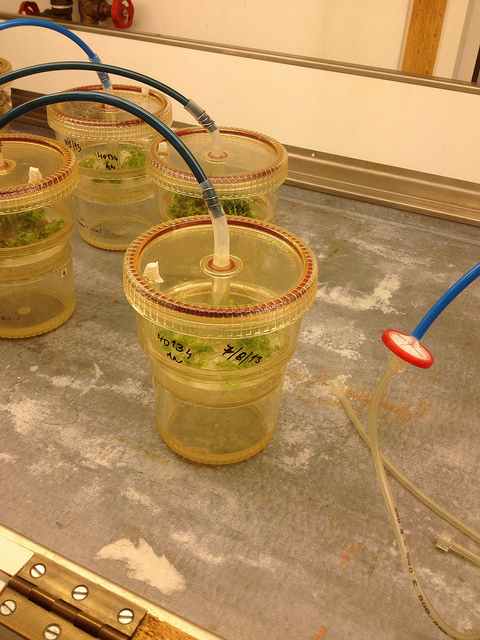 They have now been taken out of storage, thawed and grown on, to test viability: they were growing in petri dishes. Bryophytes, used to dry conditions in their native environments, suffer less than other plant material from the dessication required for cryopreservation. 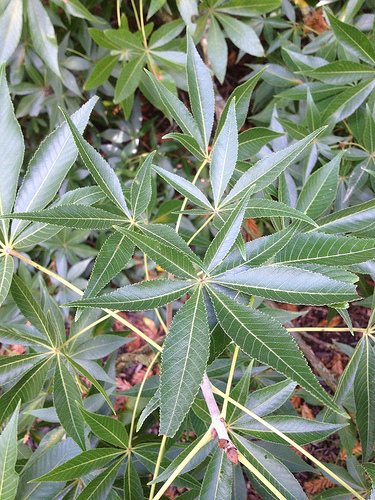 With other plants, hormone treatment helps improve success rates in thawed samples, for example the use of ABA (abscissic acid), which in nature prepares the plant for winter dormancy. 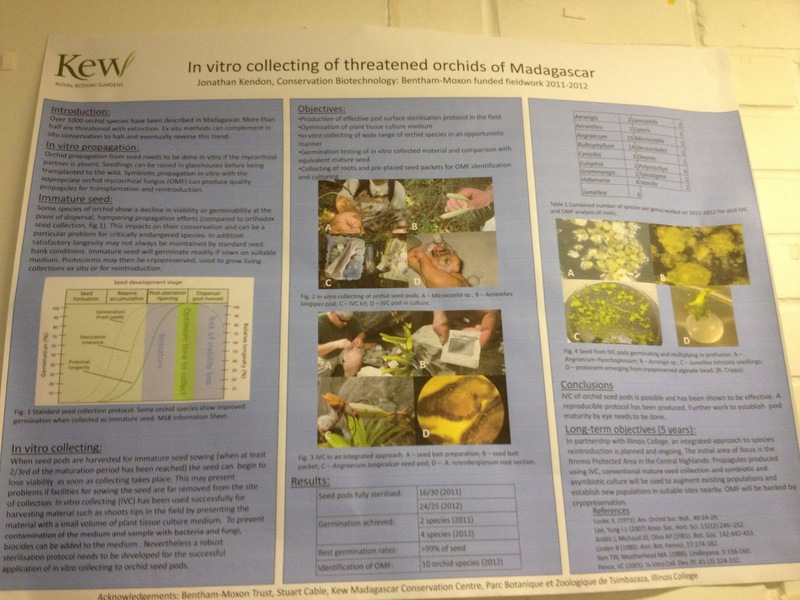 If you find yourself as drawn into this interesting subject as I was (this was my favourite lab visit at Kew), there is a presentation online, which Margaret, my guide today, prepared on Bryophyte ex-situ conservation at Kew. 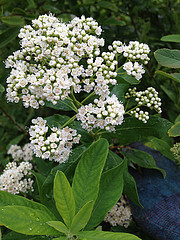 Most plant material (embryos extracted from the seeds or plant meristems, for example) is sterilized (with sodium dichloroisocyanurate, effective in low concentrations) and then grown on in a substrate that contains a mix of macro- and micro-nutrients. Each species favours a different mix of minerals and sugars, the latter needed because most plants' cells cannot photosynthesize in the light of the lab. However, sugars attracts all sort of pathogens, so sterile conditions are required. 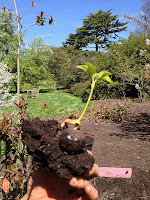 a liquid medium would deprive the roots of oxygen (waterlogging), compromising the success of propagation. There's always an exception, though. Some plants are grown in liquid medium, especially when great quantities are required. That is the case with the marsh violets (Viola palustris) that Kew have been providing to the Durham Wildlife Trust to help restore the habitat for the declining small pearl-bordered fritillary butterfly. To avoid waterlogging, a special contraption is used where oxygen is pumped at regular intervals into vessels that look like smoothie glasses, whose bottom is filled with liquid. 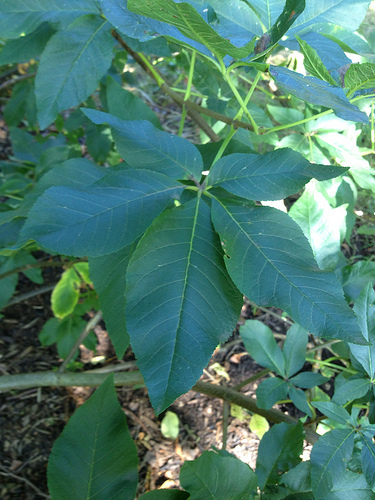 The level of the medium rises, during pumping, to the level of the plants, located on a disc higher up. After a set amount of time, the level of the medium drops again. Spoilt as they are in their ideal substrate, either jelly or liquid, and without competition, pests or diseases, plants grow relatively fast and multiply... a side effect for the most successfully propagated species, is the onerous splitting and potting on in jars that staff has to undertake. In the case of the marsh violets, that side effect is the objective: while they are clones, not genetically diverse, the propagation exercise started with a large enough number of genetically diverse plants from seed, which makes it acceptable in terms of resilience of the species. Orchids are also an interesting case. In cultivation, they are so difficult to grow because the seeds do not contain any endosperm (the nutrients that feed the embryo until it is out of the ground and able to photosynthesise). 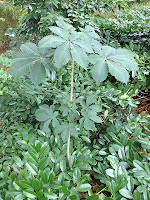 Without endosperm, food must come from other sources, until the first green leaves can produce it for themselves. 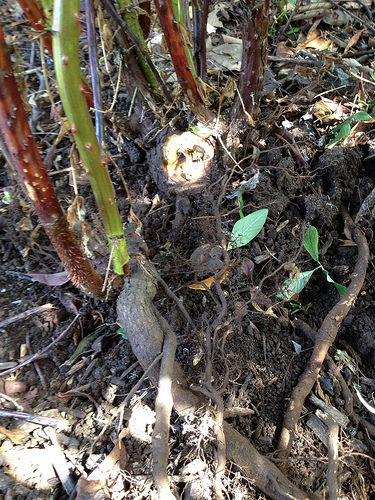 In the wild, it is mycorrhizal fungi, working in symbiosis with the seeds, that provide food for the embryo. 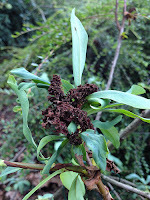 Therefore, the distribution of the orchids is limited to areas where suitable fungi live. 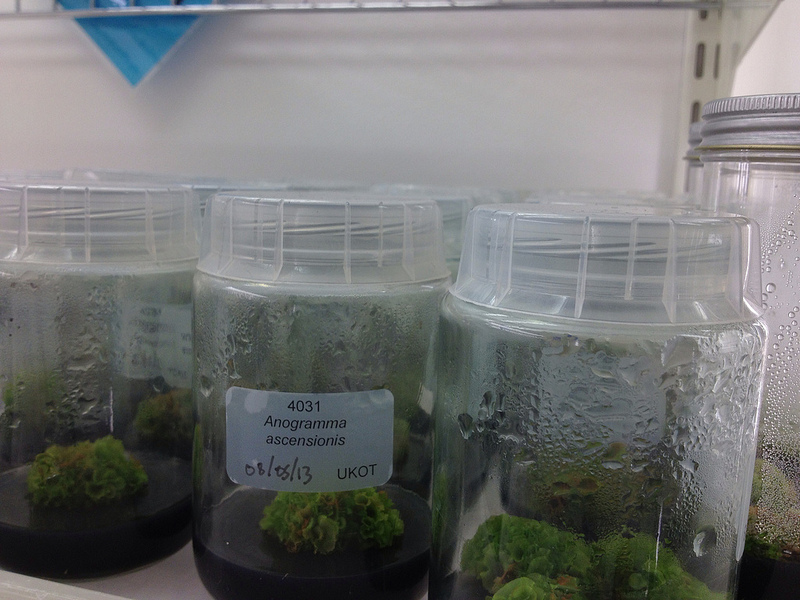 For terrestrial orchids in particular, it is difficult to propagate them from seeds in asymbiotic conditions, as the organic nutrients produced by fungi are difficult to supply in the artificial conditions of the lab. In some cases, the fungi themselves lend a hand. Bags of orchid seeds are buried in the soil, so they get "contaminated" before being taken back to the lab, fungi an all. Not an easy procedure! 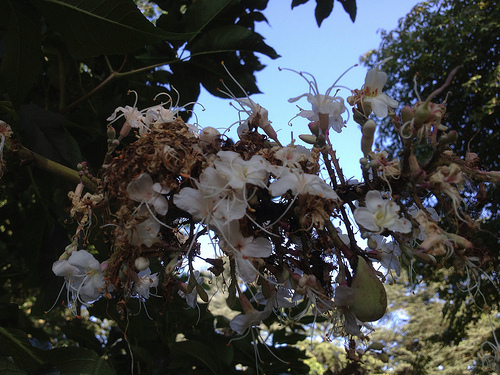 Epiphytic orchids, the tropical species growing on trees, are slightly easier to feed in a lab, because they are used to finding inorganic nutrients from washout pools that form when it is raining. Really fascinating, thanks Margaret for the informative and really enjoyable time you spent teaching me. 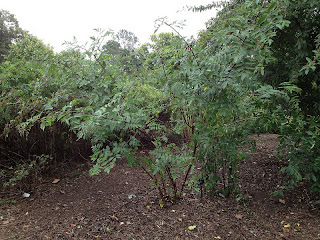 I am glad I only decided to tackle this bed now, with a few months of experience, because it is really daunting: Cotoneaster, Rubus and even Spiraea (canescens) seem to have gone really wild and taken over all the available space, growing tall, growing wide, getting one inside the other, thick and dense vegetation. One thing that I will regret, though, is that I will never manage to finish this bed, and its stock-checking, if I want to do all the rest properly with one week to go and a few rainy days forecasted... Today was one of those and the frequent showers meant that it took me two days to cut back only one Rubus... my last one in Kew. 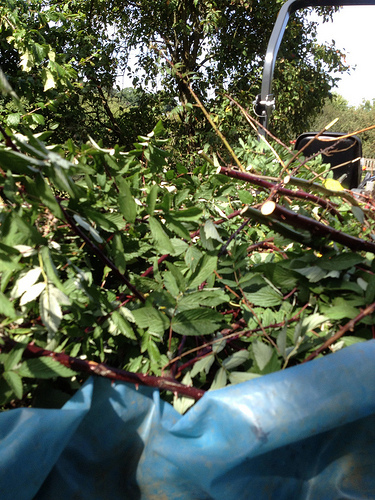 Well, one can only do what one can do, but at the end of the two days at least the Rubus diversifolius - a particularly nasty one, this one, I have been pulling bits and pieces out of my body all evening :( - looks like it should look once again. 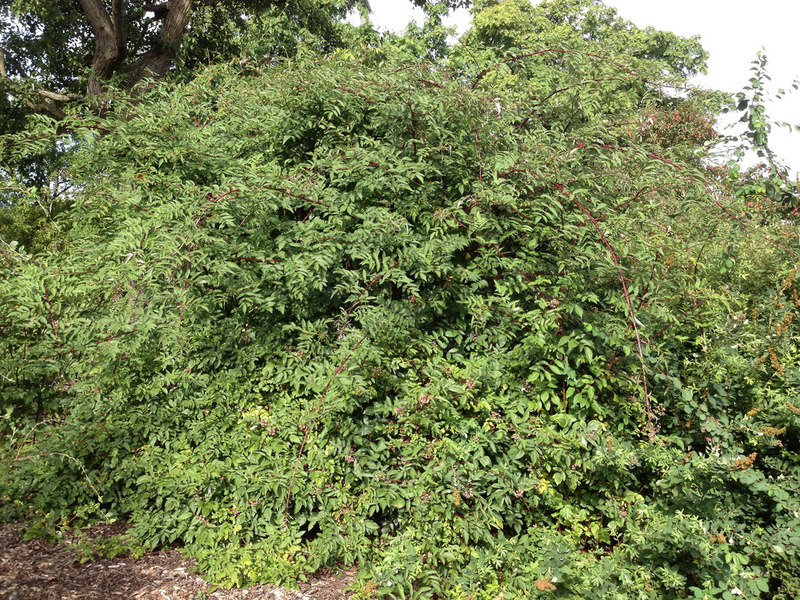 It looked like a large shrub, like a Sorbaria, when I first looked at it from a distance: thriving it was, more than any other Rubus I have dealt with so far, at some 4 meters tall and wide. Going round and round it, under Pyruses and between Spiraeas, I realised it had escaped from the other side of the bed and formed a solid wall through its whole width. 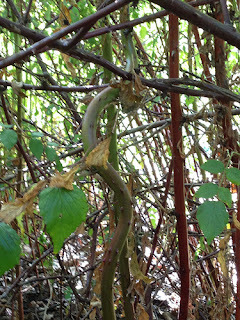 It had propagated by stolons, rather spiny ones to boot, that then died back (and spines on dead wood are even nastier) and remained there hanging, at head height, joining the clumps. 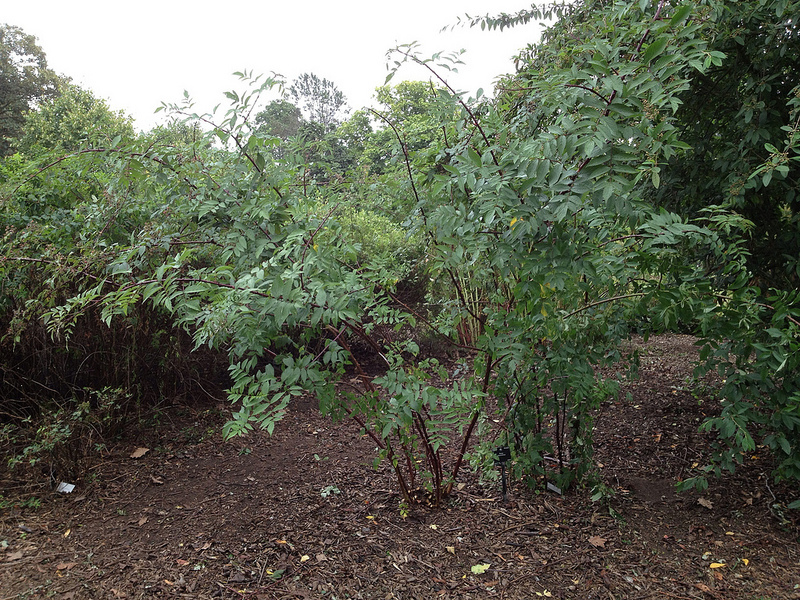 As usual, the most recent canes were thriving, while the old ones (at the original location of the plant) less so. 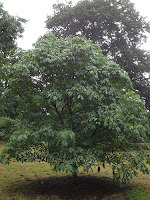 Because the side it was thriving on is also the sunniest, and the bed is rather empty, I decided I would keep two plants, one at each side of the bed, and suggest in the stock-check notes that they relocate the labels (after verifying the plant, to be sure it has not hybridised). At the start, the task was so daunting I felt like asking for moral support from a member of staff at tea break. Support given and gratefully received, I set out to sort this. Systematically was the way to go. Some of those clumps of canes had developed rather large roots, but mostly they were shallow-rooted. 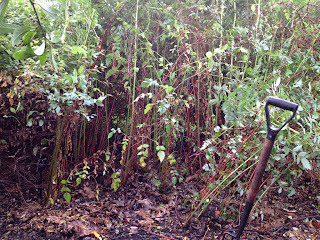 One clump at a time, starting from the sides, had to be removed: cutting the canes at 1 m high and digging them out; carefully pulling away the bottom half holding it by the roots before untangling the top part of the branches from whatever they were clinging to, with the help of a fork. Carefully and slowly, to avoid injuries. Last, but by no means the least complicated part of the operation, with the help of a fork and a folded tarp I had to load everything onto the tractor's trailer. Some 5 trips in all. At the end of the two days, here are the plants as they look at either side of the bed. The manager came round and told me that they are going to keep up the good job I've been doing... my departure is approaching fast. The British conker is under threat due to an alien attacker, according to experts from Kew. 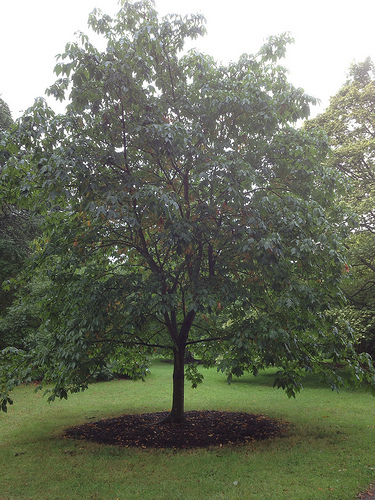 Despite the poor appearance of horse-chestnut trees infested with C. ohridella, there is no evidence that damage by the moth leads to a decline in tree health, the development of dieback, or tree death. 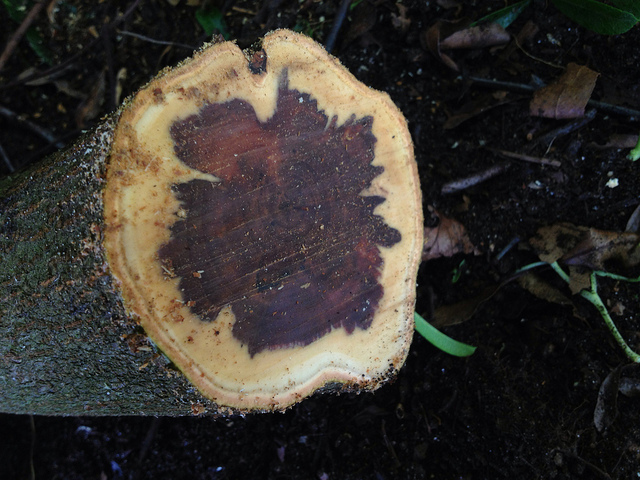 Trees survive repeated infestations and re-flush normally in the following year. Rather helpfully, the RHS asks for the citizens' participation in a monitoring exercise to understand the pest and its effects better. And at Kew an experiment is undergoing, on which one of my student colleagues is centering her final project. 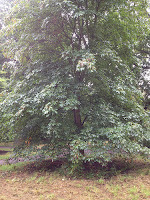 One of the A. hippocastanum at Kew was injected some four years ago with a chemical against the moth. While the chemical is not active any more in the plant, it would appear that attacks from the moth are however having a smaller impact than they used to before the treatment... investigating why that is the case is what my colleague is doing. Anyway, today - team day - we were doing the tree circles around Aesculus, which triggered the idea for this post. 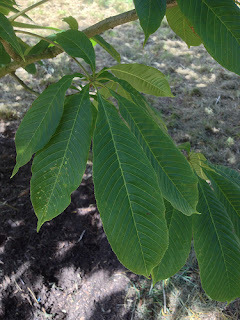 Majestic trees, horse-chestnuts, and the damage of the leaf miner to European native A. hippocastanum is rather ugly to the sight, and can cause premature leaf fall. 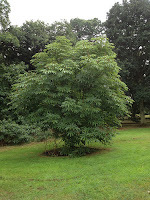 In response to this new pest, it has been suggested to use alternative species in the garden, namely A. indica (Indian horse chestnut). But the American ones are also attractive and do not seem affected. Their common name is "buckeye", due to the appearance of the fruits: brown with a pale scar, like a stag's eye. 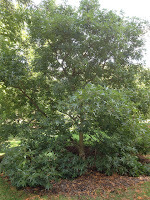 A. sylvatica (painted buckeye), a large shrub or small tree. I found a description of the tree and its colour variations in the Falls Lake area on a blog. A. flava (sweet or yellow buckeye) is a larger tree, with yellow flowers, also described in the PFAF database. 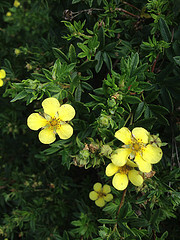 A. californica, which was still flowering, by the way, has pleasant, smaller dark green leaves. I noticed it a while ago while walking into the yard (next to which - lakeside - this part of the Aesculus collection is located; there are more Aesculus next to the Pavillion restaurant). 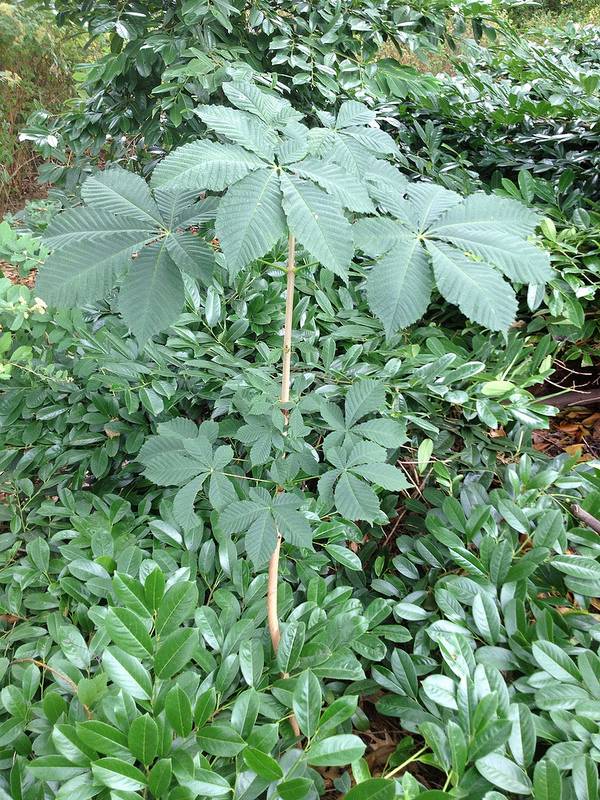 and my very favourite: A. glabra var. 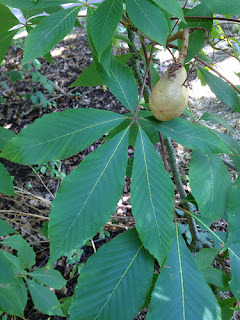 arguta (Texas buckeye) with rather distinctive, narrow lanceolate leaflets, that also look thicker and shinier (smooth, as the name implies), akin to an evergreen's. 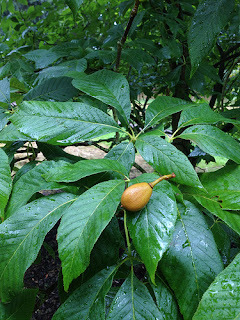 About the seeds of these plants, I have read that the conkers are not as suitable for the namesake game from the other species as they are from A. hippocastanus. 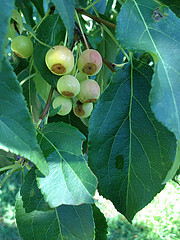 All, however, are mildly poisonous, as they contain bitter saponins (deer and wild boar do not seem to mind however), even though some species are eaten, cooked after leaching out the poisonous chemicals. 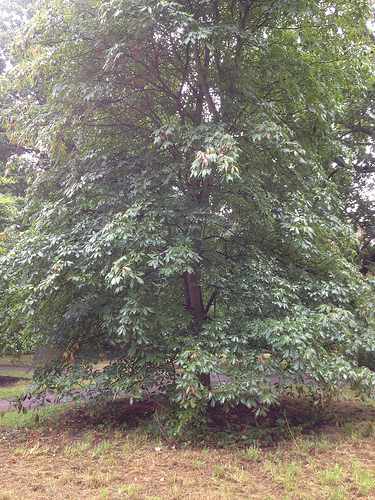 How easy it is to tell conkers apart from sweet chestnuts? Although I have never had any problems myself, I have seen people mixing them up, which is obviously not good given the latter is delicious raw or cooked while the former may give you a stomach upset. 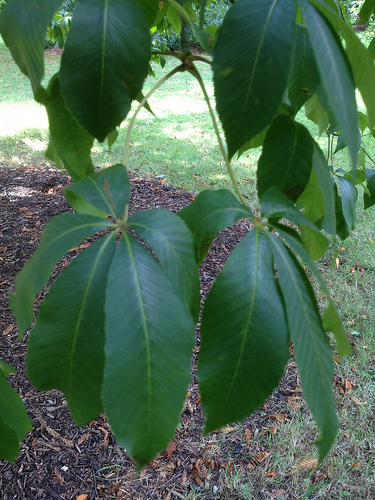 I find sweet chestnuts are flat on one site and rounded on the other, mostly with a typical heart shape, point up, which sometimes terminates in a fan of hairs. ... talking of germinating conkers, over these few months I have found quite a few seedlings and saplings of Aesculus in the South Canal beds (those and Juglans nigra's), so I suspect it must be the squirrels - obviously also immune to saponins! Today, being Monday, I looked for a soft start, and very conveniently I could refer to a chat I had had with my manager on Friday. 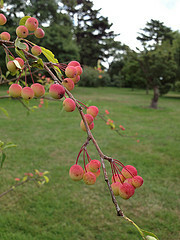 A species Crataegus was reverting back to the rootstock, outside our area, and I offered to cut all the suckers. 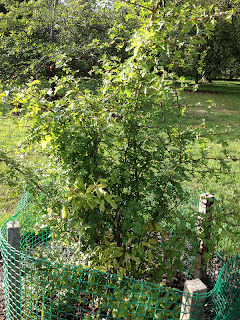 I have already mentioned how suckers from the rootstock may draw so much energy from a grafted plant to kill the species that was grafted on it. This is an example. 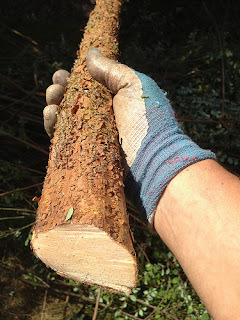 ... and after cutting back all the suckers, the species is revealed! Not thriving at the moment, it might need propagating, if we can get some good material. After warming up with that, I started on bed 6 of 6, or 437-01 as it is called within the South Canal beds area. It is pretty much a solid block of greenery, mainly Cotoneaster and Spiraea, at the moment. 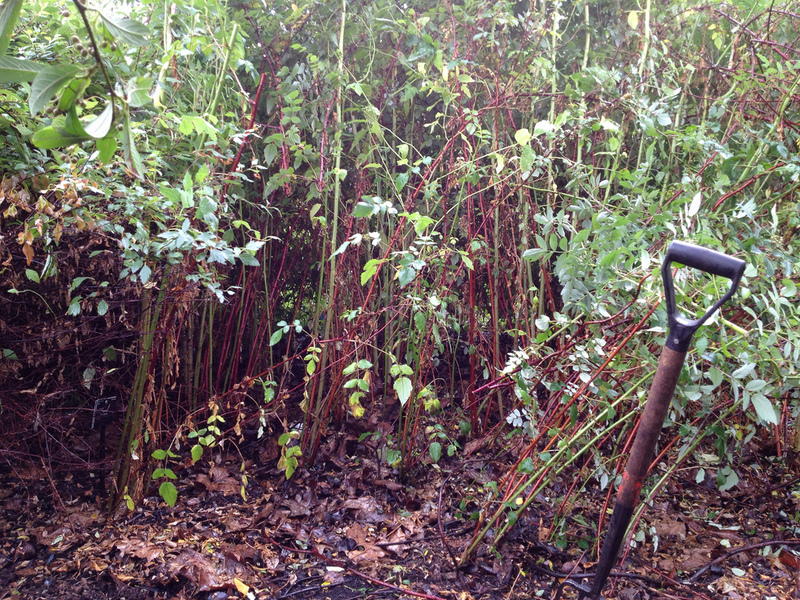 My colleague has cut the shrubs back to the edge of the bed already. If everything goes to plan, by the end of the next two weeks, most plants will be clearly delineated, so that I can stockcheck them, finding the labels and assessing the health conditions of the plant. It was not a great start. 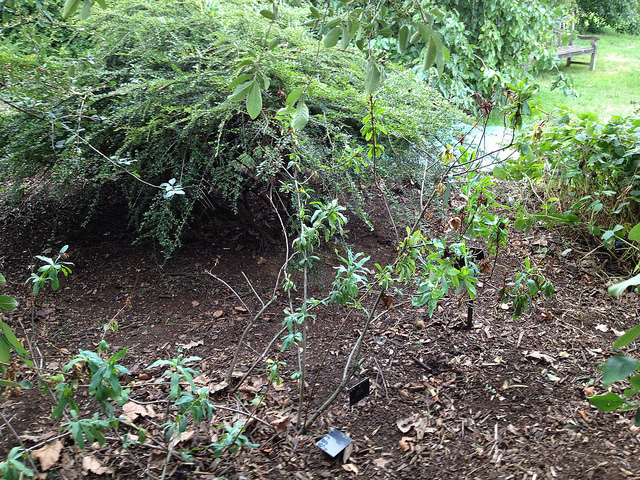 Somewhat unexpectedly, as soon as I walked through the first shrub, I found a load of litter inside the bed. 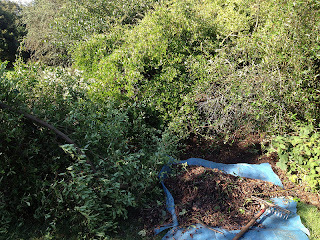 I hope it was not a human being ripping apart a bin bag full of stuff... but anyway, I had to do garbage collection as a first thing, which was not very pleasant, but now it's done; weeding of the front of the bed is also done, and a handful of shrubs have been cut back to their allotted space. No pictures, for the time being, all will be revealed in due course. A couple of trips to the compost heap to tip my woody cuttings, and those of some colleagues I was helping with the tractor, and the first day of my last but one week at Kew was gone. Tomorrow is team day. More goodbyes today as the apprentices left the Arboretum to go under glass (that is what they do in their second year). This trickle of people going away keeps reminding me of my imminent departure and is making me rather sad. My manager came out, had another look around, and said my work has had a big impact on the South Canal beds, and I may be proud of what I have achieved. And so I should, it's been nice of him to say... but at the moment, it is the thought of leaving the plants I have cared for so much that is foremost in my mind. 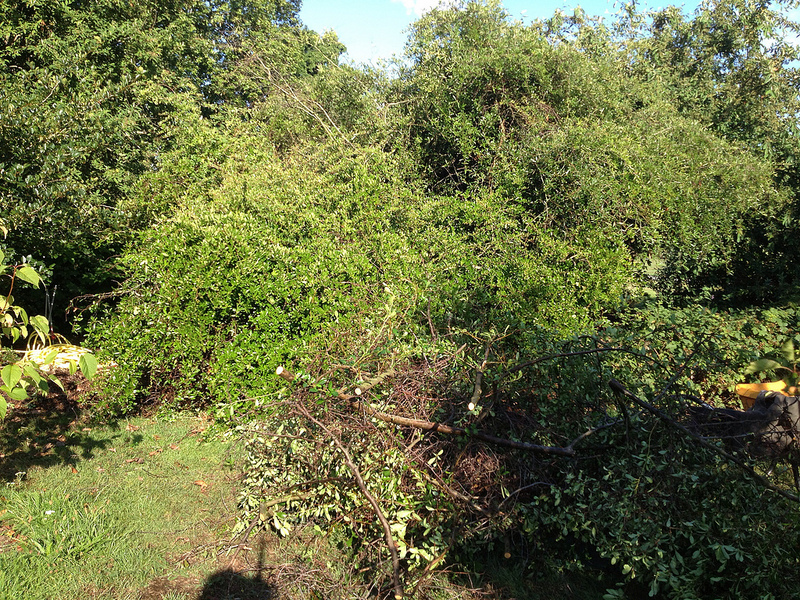 ... but the story begins with an overgrown Pyracantha that was in the way of grass mowing. 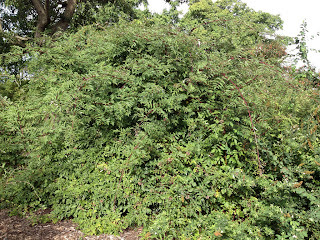 That is what I started to tackle, which took me one day and a half, as it turned out it was likely two Pyracantha, very similar but different enough (to be confirmed). But it is probably worth starting the story from the beginning, with Kew chronically understaffed, so that not all areas get a permanent member of staff to care for them. 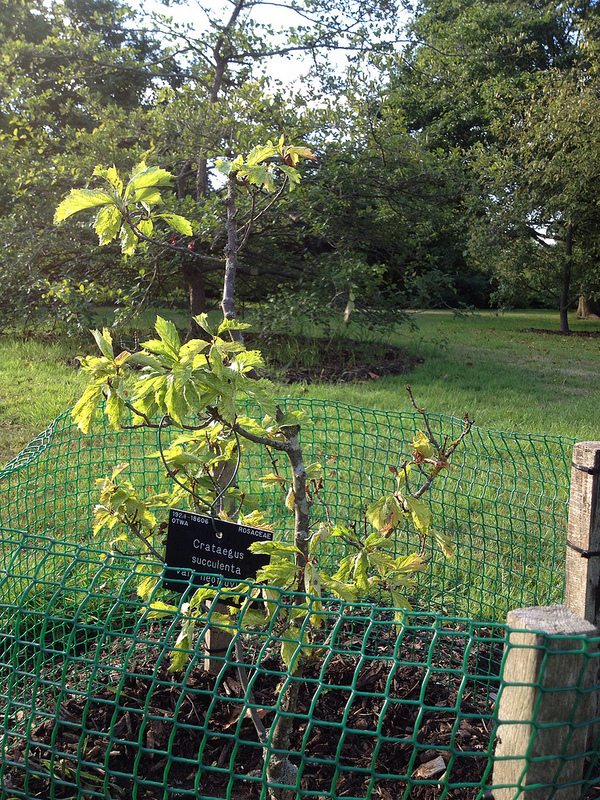 Students get 3 months placements in different areas of the gardens, while apprentices and trainees get to stay one year in the Arboretum, but they spend six months each in the two different teams... the result is that learning is maximised for the individuals concerned, but some areas may suffer from lack of continuity in management. 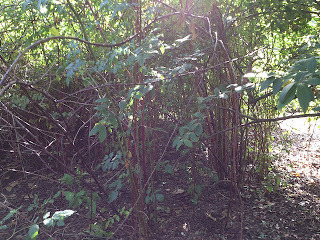 In an area with suckering and freely self-seeding specimens as the one I am working in, matters can quickly get out of hand, and that is what I think happened. Hence, all my crawling under overgrown plants and large scale cutting back. 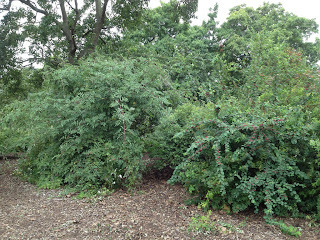 It did take me a couple of month to get my head round what was needed, and it was only when I started the stockchecking project that getting in depth knowledge of the plants in the beds gave me the confidence to start tackling the overgrown shrubs. After that I thrived, and you know that I enjoyed talking about it - this story is another one of my much cherished adventures. The Pyracantha was the perfect practice ground for my newly refreshed and recently expanded pruning skills. Daunting, though. I started going round the plant and trying to understand where to start from. Then cutting the more obviously misplaced branches. 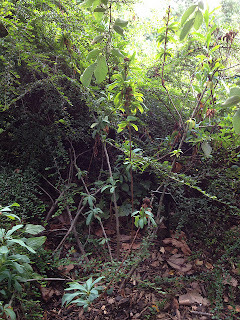 Then I did not seem to know what to tackle next and felt so overwhelmed... when I remembered Rossana's advice: clean everything around you, so that you can have a good look at the plant. Which I did: there were plenty of leaves on the ground. And while I did that, it gradually became clearer how to proceed further. Some of the oldest branches were a real tangle, and they turned out to have some kind of dry rotting going on inside. 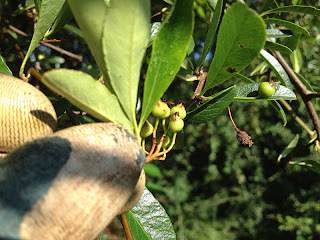 The colour of the wood, and new growth in particular, and the slightest difference in the leaves' and fruit's shapes made me thing there must have been two different plants there, so I decided to tackle them separately. I will have to get someone to verify their identity later. 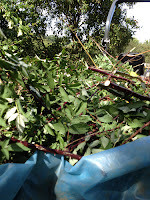 It took me most of the Wednesday to sort the first Pyracantha... then another couple of hours to sort the second one. 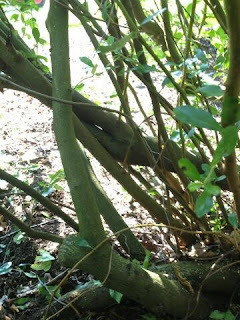 There was air flowing through the stems at the end of it, and there were much fewer crossing, damaged and split ones (as many as could go while still leaving a solid framework to sustain the new growth, which is rather floppy in these two specimens) - that means healthier plants; besides, they still looked presentable enough for the enjoyment of the visitors. It was then that it became apparent that the Cotoneaster was encroaching on a plant new to me: Sibiraea angustata. 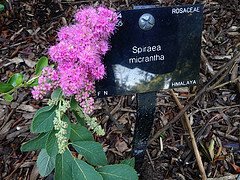 A relative of Spiraea, native to China, Sibiraea has some medicinal use for indigestion in its native land, and - I read - has raised some scientific interest for containing eight new acylglucosides, in the class monoterpene. 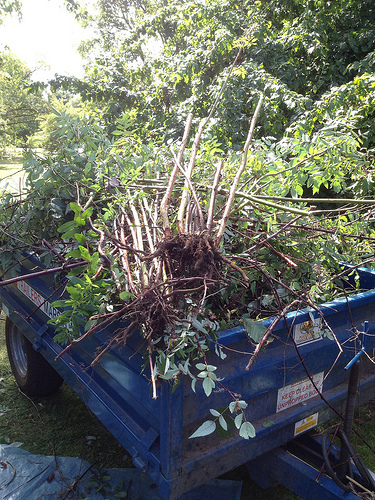 And here is a view of the bed, at the end of the two days. I will have to seed the grass edge, as the shade from the Pyracantha had killed the grass. But it looks otherwise good, doesn't it?